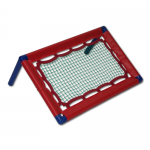 A low rebound net for individual or small group throwing and catching activities. View the videos below to see it in use. By holding the Mini Slip Net it allowed us to give a range of different catches that make it an ideal practice for fielding both in the slips and close to the bat. This time we kept the Mini Slip Net on the ground and worked on our catching and movement. We found that this activity replicates walking in and reacting to a sharp catch.